Mardi Gras begins tomorrow. 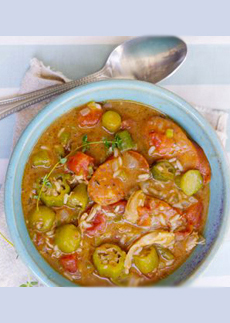 If you’d like to celebrate with the taste of New Orleans, whip up a gumbo. This recipe is from Chef David Venable of QVC, who calls it “an easy-to-tackle version, filled with great Louisiana flavor and spice.” Gumbos have a lot of ingredients, but the cooking technique isn’t demanding. Says David, “When preparing, be sure to chop your veggies in similar sizes to ensure that they cook at the same rate.” In this recipe, okra is used as a thickener, and also gives personality to the gumbo. An easy gumbo, with chicken, okra and sausage. Photo courtesy QVC. 1. SEASON the chicken thighs with creole seasoning. Heat 1/2 tablespoon oil in a 6-quart or larger stockpot over medium-high heat. Brown the sausage and set aside. 2. ADD the chicken to the pot with the sausage drippings and cook over medium-high heat until brown on both sides. Remove the chicken and set aside. 3. ADD the remaining 1/2 cup of oil and the flour, over medium heat. Cook the mixture, stirring slowly and constantly, for 10-15 minutes, or until dark brown. Be careful not to burn or scorch. 4. ADD the onions, garlic, celery and bell pepper and cook for 5 minutes. Slowly add the broth and stir until there are no lumps. Add the tomatoes, rice, salt, cayenne, bay leaves, thyme, and okra. Stir and bring to a simmer. Continue to simmer for 10 minutes. 5. ADD the chicken and cooked sausage to the gumbo. Bring the mixture to a boil and simmer for 20 minutes. Remove the bay leaves, plate, garnish with a sprinkle of parsley and serve with a side of rice.